Stock # 419356, Turbocharged Diesel V8 6.6L/403, Automatic, 21402 mi. ENGINE, DURAMAX 6.6L TURBO-DIESEL V8, B20-DIESEL COMPATIBLE (445 hp [332 kW] @ 2800 rpm, 910 lb-ft of torque [1220 Nm] @ 1600 rpm) Includes capped fuel fill, (K40) exhaust brake and (K05) engine block heater. ), Wireless Charging, Windows, power with driver express up and down and express down on all other windows, Window, power, rear sliding with rear defogger on Crew Cab or Double Cab models, Wheels, 18" (45.7 cm) chromed aluminum includes 18" x 8" (45.7 cm x 20.3 cm) steel spare wheel. Spare not included with (ZW9) pickup box delete unless a spare tire is ordered. (Requires single rear wheels. ), Wheelhouse liners, rear (Requires Crew Cab or Double Cab model. Not available with dual rear wheels. Deleted with (ZW9) pickup box delete. ), Wheel, 18" x 8" (45.7 cm x 20.3 cm) full-size, steel spare. Spare not included with (ZW9) pickup box delete unless a spare tire is ordered. (Requires single rear wheels. Included with (E63) pickup box. Available to order when (ZW9) pick-up box delete is ordered. ), Visors, driver and front passenger illuminated vanity mirrors, Universal Home Remote on Crew Cab or Double Cab models (Removed when (TRW) provisions for roof mounted lamp or (VYU) Snow Plow Prep Package is ordered. ), Transmission, 6-speed automatic, heavy-duty, electronically controlled with overdrive and tow/haul mode. Includes Cruise Grade Braking and Powertrain Grade Braking (Requires (L96) Vortec 6.0L V8 SFI engine.). This Chevrolet Silverado 3500HD has a dependable Turbocharged Diesel V8 6.6L/403 engine powering this Automatic transmission. Trailering equipment Trailering hitch platform 2.5" with a 2.0" insert for HD, 7-wire harness with independent fused trailering circuits mated to a 7-way sealed connector to hook up parking lamps, backup lamps, right and left turn signals, an electric brake lead, battery and a ground, The trailer connector also includes the 4-way for use on trailers without brakes - park, brake/turn lamps, Trailer brake controller, integrated, Tires, LT265/70R18E all-season, blackwall (Requires single rear wheels. ), Tire, spare LT265/70R18E all-season, blackwall (Included and only available with (QWF) LT265/70R18E all-season tires or (QGM) LT265/70R18E all-terrain tires. Available to order when (ZW9) pick-up box delete is ordered. ), Tire carrier lock keyed cylinder lock that utilizes same key as ignition and door (Not included when (ZW9) pickup box delete or (9J4) rear bumper delete is ordered. ), Theft-deterrent system, unauthorized entry, Teen Driver mode a configurable feature that lets you activate customizable vehicle settings associated with a key fob, to encourage safe driving behavior. It can limit certain vehicle features, and it prevents certain safety systems from being turned off. An in-vehicle report gives you information on your teen's driving habits and helps you to continue to coach your new driver, Tailgate, EZ-Lift and Lower (Deleted when (ZW9) pickup box delete is ordered. 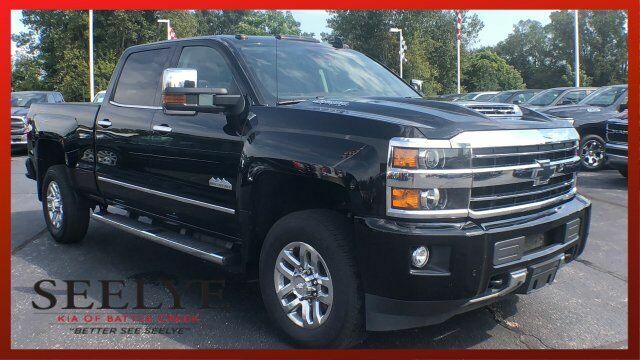 ), Tailgate and bed rail protection caps, top, Steering, Recirculating ball with smart flow power steering system, Steering, Digital Steering Assist (Requires Double Cab models and (L5P) Duramax 6.6L Turbo-Diesel V8 engine or Crew Cab models. ), Steering wheel, leather-wrapped with audio and cruise controls, Steering wheel, heated, leather wrapped with audio and cruise controls, Steering wheel audio controls, Steering column, manual Tilt-Wheel and telescoping, StabiliTrak, stability control system with Proactive Roll Avoidance and traction control includes electronic trailer sway control and hill start assist, SiriusXM Satellite Radio (subscription required), Sill plates, bright, Seats, front full-feature leather-appointed bucket. Includes 12-way power driver and front passenger seat adjuster including 4-way power lumbar, 2-position driver memory, adjustable head restraints, (D07) floor console storage pockets and (K4C) wireless charging., Seating, heated and vented perforated leather-appointed front bucket.